I don´t know why, but the true is that , three years ago, I fell under a spell. And it wasn’t good at all. Since then, I’m trying to breake it. I’ve only found peace and calm in especial moments and places. Just there I feel that maybe someday I will be able to find myself again. No sé por qué, pero la verdad es que, hace tres años, caí presa de un hechizo. Y no fue precisamente bueno. Desde entonces intento romperlo. De momento solo he hallado algún momento de calma y paz en ciertos momentos y lugares. En ellos siento que algún día será capaz de encontrarme a mí mismo. Click the first to enlarge and scroll. Clicka en el primero para verlo en modo presentación. Inari lake is the sacred lake of Sami people. I enjoyed the starry night in such an special place with Javi, who had never seen an aurora before. Despite the next morning we had to start a seven days trekking with snow rackets along the frozen river Lemmenjoki , we decided try our luck. For two times we were about of gave up. But we kept tight waiting for the big one. And, finally it was worthy. 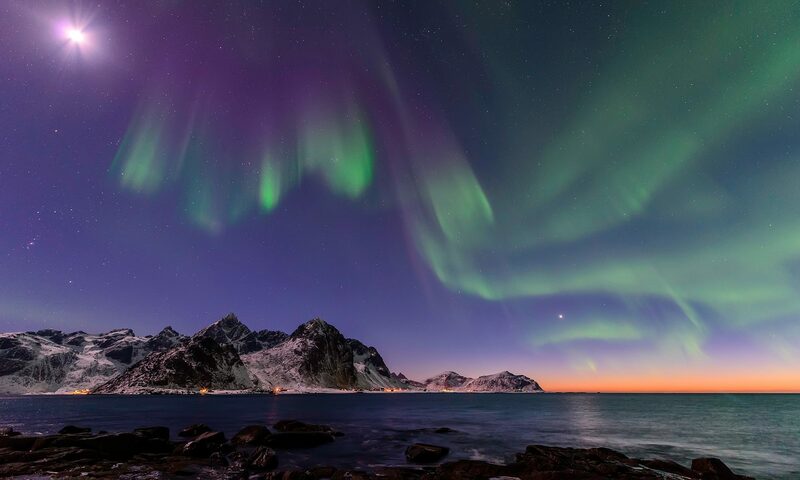 The beaches near Tromso under an Aurora Borealis, with the light pollution of the city. Photo taken in some place at the south of Taouz, Morocco, Algerian border. This is Hassan, a Berber dromedary rider. He’s the one who guided me through the Sahara night. Once we were at the top of a dune, we just sat and waited the sun rising, enjoying every word of silence, under Moon and Venus and surrounded by an infinite sand sea. This is The Calderona Mountains. The place where I belong. In the distance, Valencia lights can not eclipse the magic of the Moon. Reine is probably the most beautiful town in Lofoten Islands, Norway. The beauty of the norwegian nights starts even when the the day is not yet over. The Moon, Orion constelation under the Moon and Venus over the orange line of the dusk where a gift for my sight. After a 8 h trekking through the Zaminafiry ethnic area in Ambalandingana, Madagascar, nothing is better than singing wrapped by the warmth of your friends, under the starry night.